Beta Hemolysis in Sheep Blood Agar. Blood agar is an enriched, bacterial growth medium. Fastidious organisms, such as streptococci, do not grow well on ordinary growth media. Blood agar is a type of growth medium (trypticase soya agar enriched with 5% sheep blood) that encourages the growth of bacteria, such as streptococci, that otherwise wouldn’t grow. Blood contains inhibitors for certain bacteria such as Neisseria and Haemophilus genera and the blood agar must be heated to inactivate these inhibitors and to release essential growth factors (e.g., V factor) . Heating of blood agar converts it into chocolate agar (heated blood turns a chocolate color) and supports the growth of these bacteria. 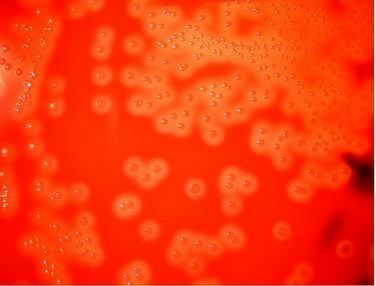 Blood agar consists of a base containing a protein source (e.g. Tryptones), soybean protein digest, sodium chloride (Nacl), agar and 5% sheep blood. Combine the ingredients and adjust the pH to 7.3. Boil to dissolve the agar, and sterilize by autoclaving. Prepare the blood agar base as instructed by the manufacturer. Sterilize by autoclaving at 121°C for 15 minutes. Transfer thus prepared blood agar base to a 50°C water bath. When the agar base is cooled to 50°C, add sterile blood agar aseptically and mix well gently. Avoid formation of air bubbles. You must have warmed the blood to room temperature at the time of dispensing to molten agar base. (Note: If you are planning to prepare a batch of blood agar plates, prepare few blood agar plates first to ensure that blood is sterile). Label the medium with the date of preparation and give it a batch number (if necessary). Store the plates at 2-8°C, preferably in sealed plastic bags to prevent loss of moisture. The shelf life of thus prepared blood agar is up to four weeks. The pH of the blood agar range from 7.2 to 7.6 at room temperature. Inoculate the plates with 5 hour broth cultures of Streptococcus pyogenes and S. pneumoniae. 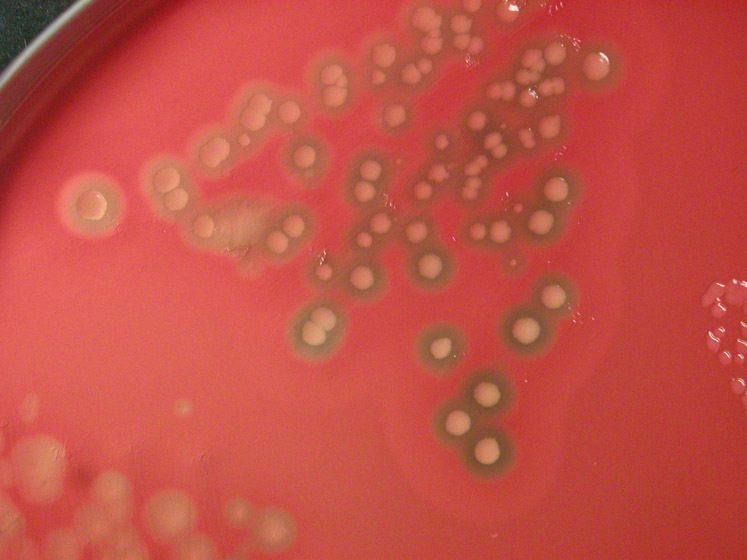 Inoculate also a plate with H. influenzae and streak with S. aureus (i.e. Satellitism Test). Incubate the plates in a carbon dioxide enriched atmosphere at 35-37°C overnight. Isolation, identification (with the use of either Optochin disc or Bacitracin disc and testing the sensitivity of the isolate) and antimicrobial susceptibility of Streptococci. Determine the type of hemolysis, if any. Certain bacterial species produce extracellular enzymes that lyse red blood cells in the blood agar (hemolysis). These hemolysin (extotoxin) radially diffuses outwards from the colony (or colonies) causing complete or partial destruction of the red cells (RBC) in the medium and complete denaturation of hemoglobin within the cells to colorless products. 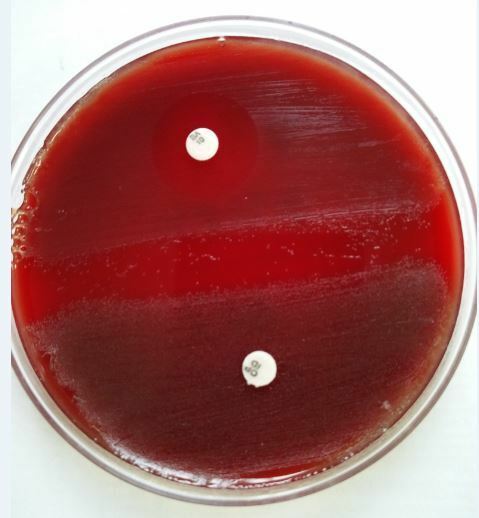 Four types of hemolysis are produced in Sheep blood agar by Streptococci namely; Alpha hemolysis, Beta hemolysis, gamma hemolysis and alpha prime or wide zone alpha hemolysis. Hemolysis is best observed by examining colonies grown under anaerobic conditions or inspecting sub-surface colonies. How does one know if the colonies they are observing on a plate have caused alpha hemolysis or beta hemolysis? 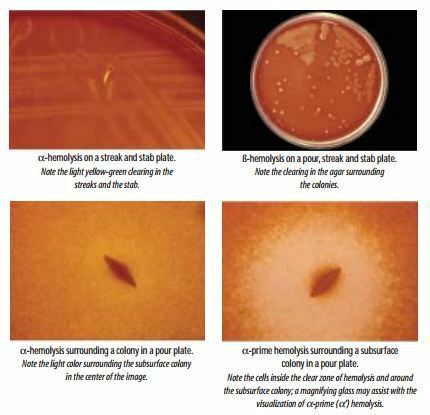 Note: To know the type of blood agar hemolysis, the blood agar plate must be held up to a light source and observed with the light coming from behind (transmitted light). If either type of hemolysis is present, then one will observe a zone of hemolysis surrounding a growing colony. Alpha hemolysis: Partial lysis of the RBC to produce a greenish-gray or brownish discoloration around the colony. α hemolysis is due to the reduction of RBC hemoglobin to methemoglobin in the medium surrounding the colony. Many of the alpha hemolytic streptococci are part of the normal body flora. But Streptococcus pneumoniae which is also alpha hemolytic causes serious pneumonia and other deadly infectious disease. Beta Hemolysis: Complete lysis of Red Blood Cells, causing a clearing of blood from the medium under and surrounding the colonies e.g. Group A beta hemolytic streptococci-Streptococcus pyogenes and Group B, beta hemolytic streptococci-Streptococcus agalactiace. For group A streptococci maximal activity of both the hemolysins; Oxygen labile SLO and oxygen stable SLS hemolysins is observed only in anaerobic conditions. Gamma or non hemolysis: No hemolysis of RBC. No change of the medium under and surrounding the colonies. Alpha prime or wide zone alpha hemolysis: A small zone of intact erythrocytes immediately adjacent to bacterial colony, with a zone of complete red-cell hemolysis surrounding the zone of intact erythrocytes. This type of hemolysis may be confused with Beta hemolysis. Target Hemolysis: Clostridium perfringens is readily identified in the laboratory by its characteristic “double zone” hemolysis also known has target hemolysis. when an incubate blood agar .it turns to black colour… every thing is like preparation. plz take out from this problem. Amazing website.Beautiful information.Thanks soo much. Very good information available to enhance knowledge. Very good for my science fair project! I have a friend who claims that adding Blood at 50 degrees centigrade causes heamolysis in the final product i.e. Blood Agar. The microbiologist using the product complain that they cannot differentiate the type of bacterial growth if its beta or alpha. Any suggestions on this issue? thank you in advance. Thank you for your comment. There are two possibilities..
2. The problem might be in the Blood you are using. Do you use sheep blood or human blood? [email protected]. I have a query with what you explained on the gamma hemolysis. Actually you have said no hemolysis. please if possible help me understand on my email. My teacher says blood agar should be sterilized in an inspissator. Should it be as it has protein in it? Your teacher might be saying media containing eggs such as Lowenstein Jensen medium uses inspissator. For Blood Agar, we sterilized blood agar base, and later you mix the blood. As blood is sterile body fluid, you do not need to sterilize it. Jiskirat, you might have mistaken, your teacher might not have said so. He/She might have says, you have to sterilize egg containing medium such as Lowenstein Jensen medium using inspissator. In the case of Blood Agar, you sterilize and prepare blood agar base, in which you add required amount of Blood (Blood is sterile body fluid, so you need not to sterilize it). For procedure, please go through the post again. Culturing Helicobacter pylori in the laboratory is not a easy process and we use other tests, mainly Urea breathe test to diagnose if the patients admitted in our hospital have H.pylori infection. As i have not grown H.pylori and also not involved in extraction of plant products to check their antibacterial effects, I am sorry, i am not able to guide you with easy steps you have to follow. I am hopeful you will find it in pubmed or other similar portals of scientific interests . Why isnt Human blood used in the preparation of blood agar plate? thank you this very good work. please could include the preparation of layered blood agar and the advantages it has over blood agar? Why there is no zone of inhibition in gamma haemolysis? how to sterile sheep or human blood for the preparation of blood agar ? Your blog is useful. I saw it for preparation of Manuals for NABL accreditation of laboratory. 2. Do we have to pack this blood agar in single packing…..
3. Sterility Check of blood agar should be done for how many percent of plates prepared. I need your help sir, am writing a project on hydrocarbon degrading bacteria, what are the procedure sir. Thank you for your query, but my areas of expertise is only on pathogenic bacteria, So i may not be the right person to guide on the project you are planning to begin. sir plz tell me that in how much time blood agar will change to choclate agar? Sir why they named delta hemolysis as one of the type of hemolysis. They are not mentioned properly in any books . Could you help me?? In some papers, it is mentioned that Staphylococcus has delta hemolysin, but we do not use delta hemolysis much often so i do not have much idea about this type of hemolysis. Where you find about delta hemolysis? The material has been of great help. Thank you.